Bonjour Novembre! You have arrived so fast this year. It feels like just few weeks ago we all merrily celebrated New Year's Day! :-) November is also time for my favorite event of the blog-o-sphere: VeganMoFo (Vegan Month Of Food), where many enthusiasts like me blog and celebrate vegan food all month long. I have attempted (and failed mid-way) VeganMoFo back in 2014. It is time to give everyday blogging a sincere try again. That's right, the challenge is to post a new vegan recipe every weekday of this month. I am definitely better prepared than last time around. Let's see how it goes! I hope you guys will give me company and cheer me along as I progress through this vegan recipe marathon? 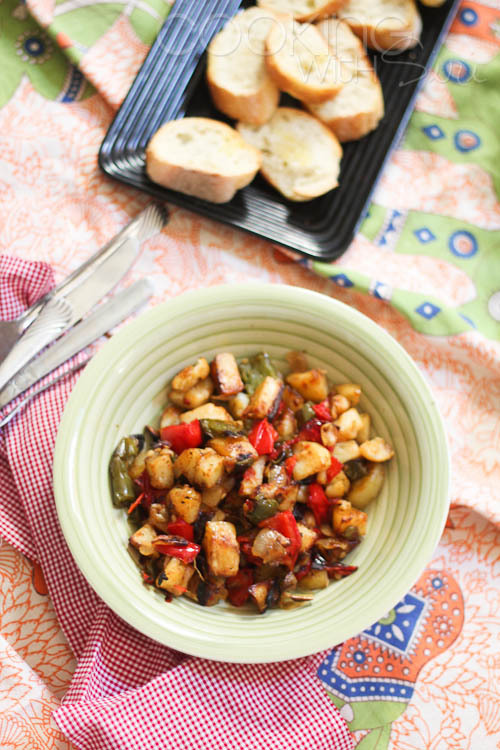 How about I kick start things by sharing an easy recipe for Breakfast Potato Hash with Bell Peppers and Onions. I checked twice. The timestamp on these breakfast hash photos is exactly two years (plus two days) ago, when I first landed in New York for a new gig and was crashing my SIL's place for a few days. It was on a weekend that she made these scrumptious Breakfast Potatoes as a part of an elaborate meal. I immediately grabbed my camera and started taking photos while we caught up with conversations about our lives. My little niece suggested we have a picnic in the living room. So spreading a blanket on the floor, I joined her amazing family for a meal to remember. During the course of next few months, I was a regular weekend visitor to their house and made so many memories to cherish. Truly, it was the best time I had after a long long time. Click here for previous posted Vegan Recipe ideas. Preheat oven to 400 F. Line aluminum sheet on a baking sheet. 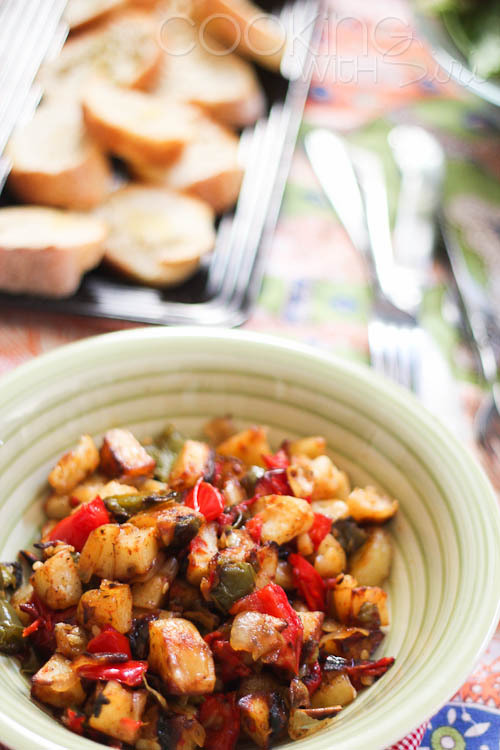 In a bowl, toss together all the ingredients except fresh herbs (if using) - potatoes, bell peppers, onion, olive oil, garlic, salt and Italian seasoning. 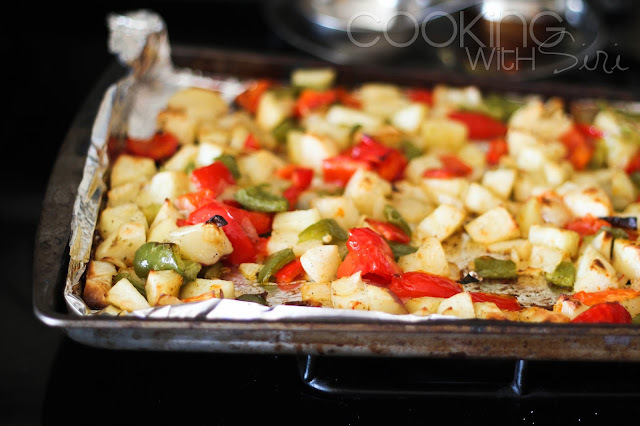 Spread them evenly in a single layer on the baking sheet and bake for 20 to 25 minutes until they are browned. Adjust seasoning if desirable and Serve. Did you like this recipe? Are you craving for more? Keep in touch on Facebook, Twitter, Pinterest and Instagram for updates on books I read, artwork, future blog posts and much more. You can also Subscribe to Cooking With Siri feed for automatic notifications and if you are looking for some inspiration, check out Cooking With Siri Recipe Index which has more than 500 recipes, neatly categorized. Happy Cooking!